Hereditary comes to us at really a time when horror films are very much a mixed bag. We still get a tonne of really bad ones out every year, but at the same time there has been some great ones over the years and there has been a horror film in my top 10 films of the year list. Now Hereditary was one that I didn’t even consider reviewing for quite some time, it only really ended up on the list because of the schedule, it was really the only film on this week, and I did want to review another horror film. I took one look at the trailer and thought it didn’t really look anything special. Then the reviews from America came forward, I know I’ve always said I’m not really one to check out reviews prior to seeing the film but when it came out in America so much earlier it’s almost impossible to avoid it. It began to get really good reviews, so I actually genuinely went in with some expectation to it. The film is written and directed by Ari Aster, and I have looked up his previous directorial work prior to Hereditary, however, I haven’t seen any of them, so I do not have an opinion on him as a writer and director. The question is though has Hereditary lived up to its hype or is it just another case of where the film critics went a little bit over board. This is normally where I would give a plot synopsis but I’m afraid I’m going to have to take the Infinity War route again and state that I am not planning on giving a plot synopsis. This is not to be lazy, the trailers for this film are actually mis-leading, there is a plot twist at a certain point in the film, quite early on, that changes the entire perspective of the movie. As a result, if you see the trailer, you are not getting the result you expected, and this film will shock you early on. Since this plot twist does happen so early on, I do not think it’s right to give a plot synopsis, and to discuss it would be a spoiler and ruin some of the best moments of the film for you. The basic synopsis that you can gather from the trailer, is that Annie, played by Toni Collette, mother dies, and shortly after her Daughter Charlie, played by Millie Shapiro, starts to act strange, and strange things keep happening to the rest of the family, including, Brother, Peter, played by Alex Wolff and Husband, Steve, played by Gabriel Byrne. That’s a very basic plot synopsis, but if you think this is just any other horror film DO NOT!! 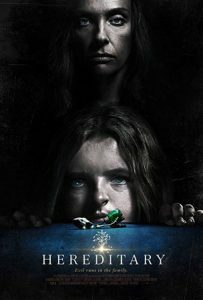 Hereditary is probably the most effective, tightly written and well executed horror film since the Witch. It’s a film that pulls no punches. It constantly has you tensing and questioning everything, with several very interesting moments. There is a tonne of twists in the story but if you actually look carefully enough there are several clues to them that will warrant repeat viewings to really see how well it’s constructed in hindsight. The film itself is very much about grieving and the actual grieving process, which adds a sense of real fear to the scenario, since this scenario is exhibited by several people on a daily basis. There is very much a sense of, that it is all potentially in main character, Annie’s, head, but as a result it leads us to question every single moment that happens on screen. This is what good, effective horror does, and the atmosphere builds with the lighting, cinematography and the score are all nominally well done. This film deals with the biggest pet peeve I have in horror films… There are no jump scares! The film gets by without them, and as a result the horror is a lot more shocking and intense, which is also Hereditary’s biggest success, as a result it is a story that’s truly frightening. It is a film that can feel quite odd at times, but it is still rather effective in those moments, it never forgets that is actually a horror film, it never tries to go into rather comedic moments to appease an audience that have turned horror films into an absolute joke! The performances are also FANTASTIC! With the various nominations for Get Out at the Oscars, this should definitely mean that many of the acts involved should be considered for Oscar nominations. Toni Collette, who in particular should get a nomination, having previously been nominated in the year 2000 for The Sixth Sense, her performance is phenomenally good in this film! Gabriel Byrne is also excellent, and I keep forgetting that he does a brilliant American Accent. It takes a while for him to really come into his own, but when he does he becomes very believable. Milly Shapiro does excellent in this incredibly creepy performance, this is a person who manages to get a clicking sound to be scary and her performance is really a good part of that. I was also particularly impressed with the performance of Alex Wolff, who I think should be up for best supporting actor. The thing is though, I’m not very sure that they will get those Oscar nominations though, which is a shame. The rest of the performances are actually very different, and the only other one to really mention here is Ann Dowd, who plays Joan, who does a really good performance in this film, actually her performance really aids a couple of the most effective moments of the film. Now Hereditary has a tonne of plot twists! As a result, it is potentially going to confuse people. I can definitely see having a lot of people look up the ending explained videos on YouTube. While I think this film will benefit from repeat viewings since the actual plot is very well written and when you really sit back and think about it those moments are still effective, it’s not exactly going to all click in the moment, it didn’t really click together for me until I was really thinking about it on the train ride home. But that’s what’s so great about it, it fesses on our fear of the unknown, it gives us just enough, so we know the basis of what’s going on, but not so much that you know way too much, hitting the perfect balance. There is also a moment early on, which I was going to criticise for being completely pointless and having nothing to do with the plot, but then it comes back at the end and you realise it had been there all along. It’s things like that which make hereditary one of the BEST films I’ve seen in 2018 so far. It’s one hell of an amazing movie! This is a text book of how to do modern horror. The film is strengthened greatly by the amazing performances of Toni Collette, Gabriel Byrne, Alex Wolff and Milly Shapiro. The film does an excellent job with cinematography and score, making some phenomenal decisions which really lead to an effective horror film. This is one film I really hope stays a solo film, since it’s most effective as is. I could go over the films best moments, but to avoid spoilers, I’m just going to say get out there and watch this film! If you like horror films this is one you cannot pass up. Just make sure you do not go with an audience that likes terrible horror films because, the audience I was with where some of the BIGGESST JACKASSES I’ve had to deal with, ruining some of the film’s most effective scenes!!! Well that’s me done for another week, sorry that it’s a shorter review this time round but I really didn’t want to put any spoilers out there. Now it’s time to move on. Next week I’m taking on another all-female reboot, like I did with Ghostbusters, and this time it’s the Ocean’s Eleven that’s getting the job. Next week I review Ocean’s Eight. With all that being said, thanks for reading this review, and I hope you’ve enjoyed reading it as much as I’ve enjoyed writing it.